In 2010 Reiser Umemoto Architects (RUR) entered a competition that might have seemed a strange fit for a small academic firm based in New York City known mostly for theoretical treatises and thoughtful residential design. Halfway around the world, a consortium of government organizations in Taipei, Taiwan, issued a request for proposals for a pop music campus that would etch its image into the local skyline. The groups wanted to bolster the Taiwanese pop industry in the competitive musical landscape of East Asia, amid rival industries in Korea, Japan, and mainland China. The competition organizers wanted an icon, something that would be instantly recognizable to national and international audiences. RUR responded with a submission that included collages showing newscasters announcing the arrival of the latest pop star while standing in front of a geometrically complex design, a mix of swooping arcs and fractal shards. 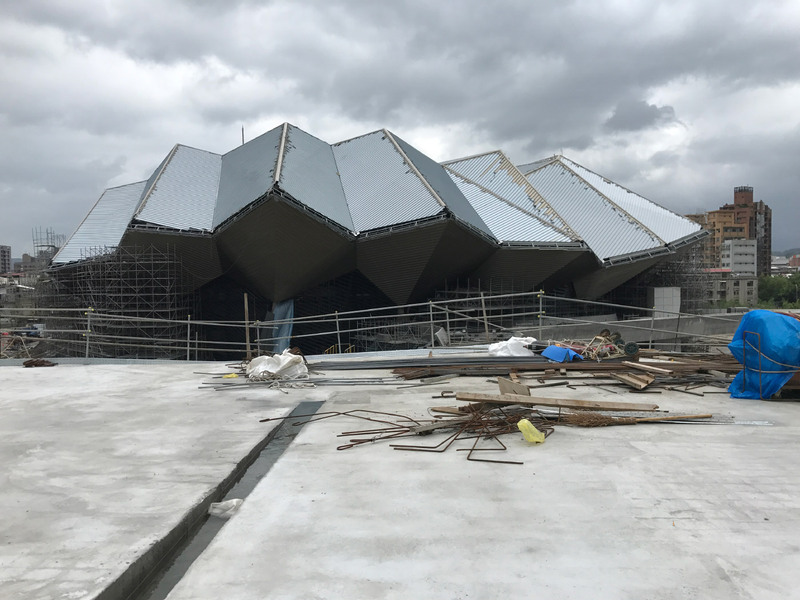 This was the same year that Instagram was launched and only 13 years after the opening of Guggenheim Bilbao, and RUR knew that their proposal had to make an instant impact. These years were a time when Taiwan was producing many high-profile competitions that got international attention for the bold names and often wild designs of the winners. 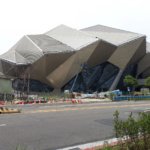 The competitions seemed to have a lot of promise, as clients were looking for avant-garde international firms to make spectacular statements with the sorts of buildings that can rocket a firm to stardom. 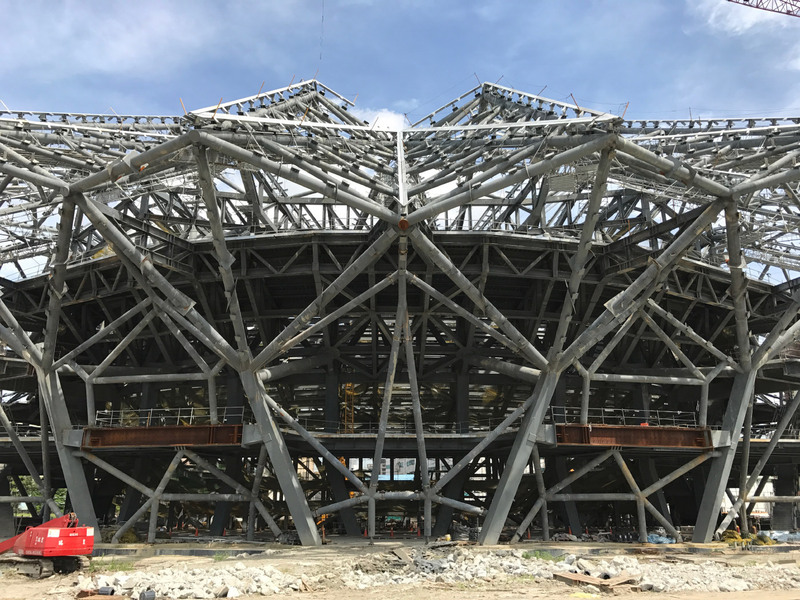 Toyo Ito’s Taichung Opera House, OMA’s Taipei Performing Arts Center, and Neil Denari’s New Keelung Harbor Service Building all came out of this icon-obsessed mania. The reality for these competitions has been more complicated. 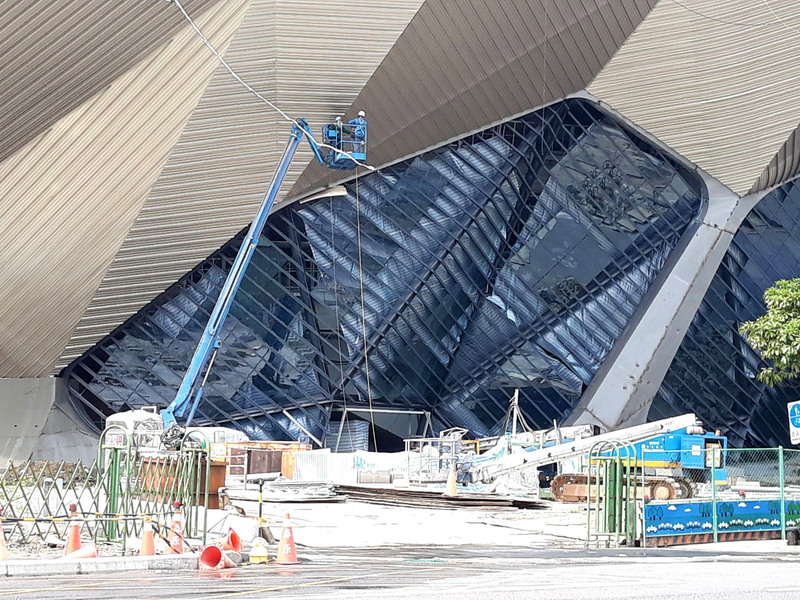 “They have big ambitions,” Jesse Reiser said, “and they have prominent architects come in, but the budgets don’t mesh with that.” OMA’s project has stalled midway through construction; Neil Denari’s indefinitely postponed. RUR has, so far, bucked the trend and is close to bringing online not just the Pop Music Center, but also the Kaohsiung Port Terminal, another Taiwanese competition winner. The Pop Music Center scheme features three main masses scattered atop a retail plinth. “Part of our strategy was to expand the project into more of an urban design project, and not just do a mega-building, so we wanted to occupy the entire site,” Reiser said. A cube housing a pop hall of fame stands at one end of the main long site. 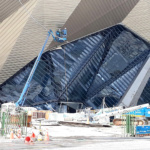 It is anchored at the other end by the “industry shell,” a faceted mixed-use building that doubles as a band shell for an outdoor performance space in the middle of the site. The main hall is split from these buildings by a road that runs through the site and is connected by a bridge that extends directly into the hall’s lobby. 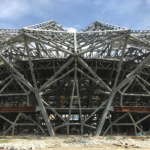 Originally a branching structure similar in form to the Kaohsiung project, the main hall transformed when the client decided to increase the size of the theater from 3,000 to 5,000 seats. 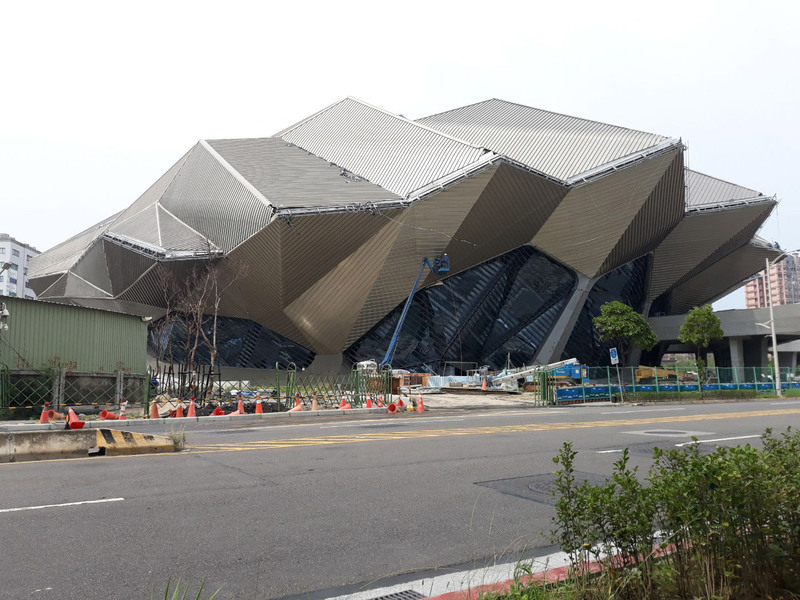 The final form resembles a sort of crystalline clam lodged into the landscape. 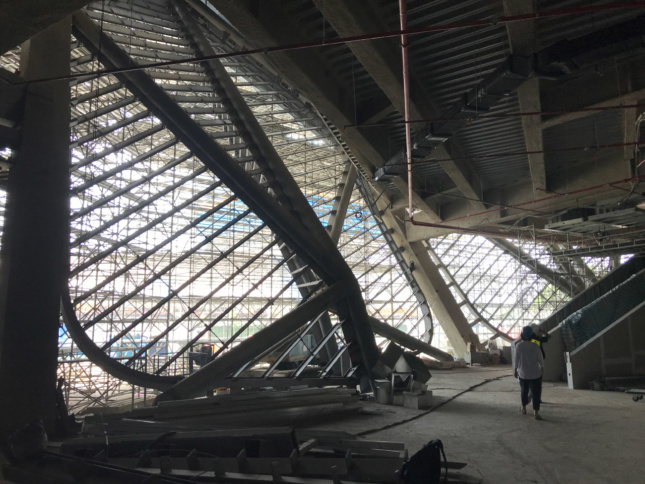 This exterior shell is punctured by the elevated walkway that connects the main hall to the other buildings and leads visitors into a double-height lobby. Faceted perforated aluminum panels with a dark green PVDF coating are backed by an air gap and black mineral wool to create a crystalline cocoon that clads the lobby and theater. The striations from the metal panels get picked up in the one-directional mullions that stripe the soaring glass windows that mark the lobby’s entrance. Large sheets of argon insulated glass units are lined with steel T mullions that run across the windows at various angles, adding an off-kilter dynamism to the entry. The interior and exterior surfaces are richly photogenic, ready to be snapped, shared, and liked by fans around the world. 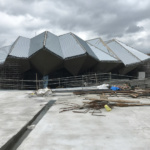 The main hall is expected to be complete in December 2018, and the rest of the complex will be fully constructed in two subsequent phases in the near future.